Status: Common regular spring and fall migrant statewide. Fairly common regular breeder statewide. Uncommon regular winter visitor south, rare north. Rare casual resident southeast. Documentation: Specimen: UNSM ZM7701, 26 May 1901 Jim Creek Canyon, Sioux Co.
Taxonomy: There are 17 subspecies recognized, two of which occur in North America: sparverius of most of North America, and paulus of the southeast US from Texas and the Gulf Coast to southern Georgia and Florida (Gill and Donsker 2017). The specimen cited above was originally identified as a “nearly typical” representative of the subspecies phalaena, the pale “Desert” Sparrowhawk (Bruner et al 1904). Swenk (Notes Before 1925; Notes After 1925) listed additional specimens of this form collected near Oshkosh and Kearney, the latter 16 Apr 1908. Phalaena is now included within sparverius. Resident: There is some evidence from banding of birds using nest-boxes in Iowa that a few birds remain all year near nesting sites, usually females, but also males (Bruce Ehresman, Iowa Department of Natural Resources). In eastern Colorado, paired birds are seen on territory year-round (Wheeler 2003). Because females are much less numerous in Nebraska in winter than are males, any wintering female may thus be non-migratory, such as one in Sarpy Co 11 Jan 2004. See Winter. Spring: Because of wintering birds, it is difficult to discern the beginning of spring migration, but numbers peak around the first week in Apr. High counts: 69 in the Keith Co area 1 Apr 1988 (Rosche 1994), 59 from Scottsbluff, Scotts Bluff Co, to Lake Ogallala, Keith Co 12 Apr 1997, and 53 in Kimball Co 14 Apr 2001. Summer: Nesting occurs in open areas where dead or dying older trees are present that provide old woodpecker holes. Old cottonwoods are particularly favored. Kestrels will also nest on sheltered ledges of tall buildings as well as cavities in natural rock or dirt cliffs. A nest box program along interstate highways has been successful; nest boxes between Omaha and Lincoln on I-80 fledged 43 birds from 32 boxes in 1994 and a high of 73 birds in 1992 (Silcock and Rosche 1994). Jorgensen (2012) considered it only a casual breeder in the eastern Rainwater Basin; this is likely due to the scarcity of trees suitable for nesting. This species is one of few raptors that double-broods, but this is reportedly rare at mid-latitudes (Smallwood and Bird 2002). Monitoring of a nest box located at the Nebraska Game and Parks Commission’s headquarters in Lincoln, Lancaster Co, suggests double brooding may occur more frequently in Nebraska than previously believed. The nest box has a camera which livestreams to the internet. A pair at this nest box has produced three double broods in the five years 2011-2016. Kestrels in Florida double-brood about 11% of the time (Smallwood and Bird 2002). A pair in Omaha, Douglas Co, apparently were into a second nesting cycle 2 Aug; 2-3 young were present 18 Aug.
Fall: Movement may begin as early as mid-Aug, when 18 were counted in 10 miles in Hitchcock Co 13 Aug 2005 and peaks in mid-Sep. Small groups of up to 15 were noted in Lincoln Co 15 Jul 2008, suggestive of grouping up prior to fall movement. High counts: 102 in Banner and Scotts Bluff Cos 3 Sep 2000, 80+ in the Panhandle 8 Sep 2003, and 78 in the southern Panhandle 20 Sep 1999. Winter: Numbers are fewest in mid-winter, especially in the north and west. Rosche (1982) considered it but a “rare winter visitant” in the northwest, most birds occurring along river valleys. It is fairly numerous and evenly distributed during the CBC period, although data indicate that highest numbers at that time occur in the south. Lingle (1989) found this species the most common raptor in his winter surveys along the lower North Platte and Platte Rivers. It is generally rare or absent from the Sandhills in midwinter. “Individuals in middle latitudes (approximately 44–36°N) partially migratory, apparently moving relatively short distances in response to local weather-related prey availability” (Smallwood and Bird 2002). High counts: 150 in southwest Nebraska 29 Dec 2004, 60 on the Scottsbluff CBC 20 Dec 2003, and 28 there 18 Dec 2010. 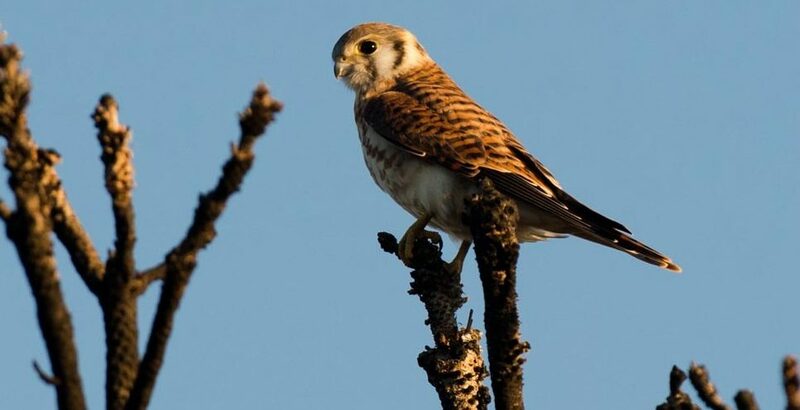 Photograph (top) of an American Kestrel at Chadron State Park 29 Aug 2014 courtesy of NEBRASKALAND/Nebraska Game and Parks Commission. Smallwood, J.A., and D.M. Bird. 2002. American Kestrel (Falco sparverius), version 2.0. In The Birds of North America (A. F. Poole and F. B. Gill, Editors). Cornell Lab of Ornithology, Ithaca, New York, USA. https://doi.org/10.2173/bna.602.